Combine the beans and other ingredients together in a large bowl. You'll need one 2-quart (half a gallon) mason jar along with a 1-quart jar (or three quart jars) to store this family sized recipe! THANK YOU for your prayers & donations to With One Accord Ministries! * Open, rinse and drain the beans before using. 1 Can Black Olives (My tester lovvvves olives, and used 2 cans) * Pour ALL the juice from the olives into your big measuring cup to make the Brine – set aside. 1 Diced Red Pepper, fresh or canned sweet corn, or one diced carrot *NOTE: Be sure to cut away the interior seed & flesh, otherwise those wonderful bits of sweetness can get a bit mushy! 1-2 Tlbs Maple Syrup if you like Candy-Bean Salad! 2. Sprinkle 1 Tlbs salt over bean mixture and using a large spoon or spatula, mix well. 3. Now, scoop the bean mixture into mason jars, leaving about 1 inch space at the top. I use a wide mouth funnel so I don’t loose any of those yummie beans! 4. THEN, vigorously stir the brine and pour quickly into jars. Cover the beans, adding a little more cider vinegar or water to cap off the salad if all the beans aren’t under the Brine. 5. If you can wait, allow the bean salad to rest in the refrigerator overnight before you dig in (this is the hard part – Bill and I always end up cracking open a jar the same day!). 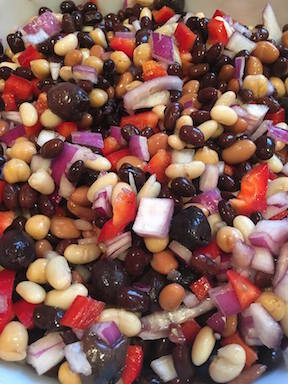 Note: You can always cut the ingredients in half to make a smaller batch of Bean Salad - but why would ANYONE do THAT? With this recipe the beans just keep getting better and better with time…but for half a batch, just cut all ingredients in half except the olives/olive juice!